Do you deserve an opportunity to relax and be pampered? Champneys offers the ultimate in luxury spa experiences, pioneering the concept of holistic wellbeing in the UK. Want to treat yourself to a five star experience but don't have a rock star's salary? Champneys offers mean you can enjoy the celebrity treatment without the price tag. Whether you want a full spa break or just a quick pick me up, Champneys vouchers let you treat yourself for less. The story of Champneys begand when Dorothy Purdew set up a slimming club at Frimleys, Northampton in 1970. On the acquisition of Champneys Tring, established as the UK's first health farm by naturopath Stanley Lieff, the modern Champneys brand was born, dedicated to bringing holistic health spas to customers across the country. Now, Champneys own and operate four destination spas and six day spas across the UK, each offering a wide range of treatments and experiences designed to promote wellbeing and relaxation. They also run Champneys International College of Health and Beauty in the grounds of the Tring resort in Hertfordshire, offering both full and part time courses to aspiring therapists. Based in Hertforshire, Bedfordshire, Leicestershire and Hampshire, Champneys spas combine state-of-the-art modern design and cutting edge science with the latest treatments from around the world, giving customers a wide selection therapies and treatments to choose from. Their staff are knowledgeable and experienced, and able to confidently advise customers on the best spa packages to suit their needs. Customers can choose from indulgent spa breaks, which combine luxurious accommodation and delicious food with a choice of treatments and a chance to make full use of the spa's facilities, or convenient individual treatments at one of Champneys' stylish day spas. There are a fantastic range of treatments on offer across all the spas, including facials with fantastic products from famous names like Elemis and Decleor, full body treatments, alternative therapies, manicures and pedicures, preganancy treatments, waxing, cosmetic treatments and more. The company also run a number of specialist retreats suitable for those wanting to lose weight or detox. Want to sample some Champneys luxury for yourself? With a Champneys promotional code you can treat yourself without spending a fortune. Whether you want to pep up your complexion with a mini facial or go all out on a full spa break with the girls, Champneys offers mean everyone can afford to treat themselves. Browse our website for a Champneys discount code that suits you, then navigate to their website to browse spas and treatments. Once you have found the right experience for you, select your nearest spa and number of guests then click 'Buy now'. Click 'Have a promotional code? ', enter your Champneys promotional code and click 'Continue'. As you can see, saving at Champneys is very easy to do, and will only take you a few seconds. So do something for you for a change, and take some time out to recharge your batteries with a proper pampering from Champneys. 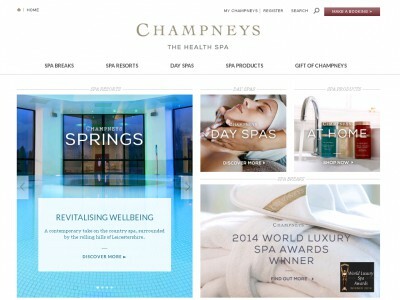 Just be sure to grab your Champneys promotional code before you confirm your booking! Want to see what life is like behind the scenes at a Champneys spa? The company's dedicated Youtube channel is packed full with exciting content such as spa video tours, interviews with holistic wellbeing experts, hair and make-up tips and more – not to mention more information on saving money with the latest Champneys offers! Check it out! Browse the website until you find the right treatment or package for you. Choose your spa and click 'Book now'. Select a date for your visit, enter your Champneys vouchers and click 'Continue'. Review your package and click 'Continue'. Click 'Pay now' and fill in your payment details to purchase. Need to get in touch with the team at Champneys? Whether you have a query about a specific treatment or spa, want to find out more about saving money with Champneys offers or you want to enquire about a specialist retreat, you can contact the customer support team through the individual phone numbers and email addresses listed on their website here. Want to stay up to date with all the latest from Champneys? The company maintains a profile across all the top social media platforms, so you can check out the latest Champneys vouchers as well as exclusive content, competitions, news from individual spas and more. Don’t forget to check them regularly, as you can never be sure when new Champneys offers might be waiting for you! Buy now online at www.champneys.com/. There are times where we all need to be pampered, and when I need to feel like a princess, Champneys.com is the first place I go. Not only can I find resorts and spas where I can simply leave the stress behind, I can do it for cheaper thanks to Champneys vouchers! Champneys offers a huge selection of locations and services for pure relaxation, and a Champneys discount code can guarantee you're getting that for the best price possible. So when you need to unwind, make sure you use your free Champneys promotional code before you make your booking!